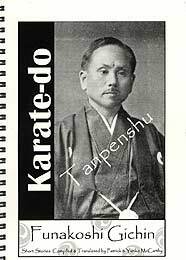 This is an eclectic book about Gichen Funakoshi, who many consider to be the father of Japanese karate. But this is not a book of commentary about this master. Instead, the man, his background and early karate history are intimately portrayed through his own early writings, his portraits, many photos and other related materials. While not aimed at the martial arts beginner or casual reader, the book would be enjoyed by historians, researchers, Shotokan karate practitioners or anyone interested in the development of karate in the early 20th century.Although some of this information has been printed elsewhere, the book does provide new translations, while also revealing the sources of the information. Central to the collection are new translations of five early writings by Funakoshi dating back to 1914 that touch on a wide variety of subjects: His thoughts on the origin of karate, other former martial artists, styles of karate, kumite, points of practice and fighting, the relationship between karate and academic study, his personal prospective of the introduction of karate into Japan, his recollections about his teacher Azato Ankoh as well as the contrast of stillness and action (yin & yang) and how it relates to karate practice. An interesting inclusion is an article by Sasaki Gogai which outlines karate and its possible origins, an article that Funakoshi had referred to in his 1922 publication, "Ryuku Kempo Karate." Another article by Graham Nobel provides insights on Gigen's son, Yoshitaka, thought to have had an important influence on the development of Shotokan karate. Also included is a translation of an elusive page of text written in old style Chinese characters that Funakoshi carefully included in his early books and retained in his 1935 book, "Karatedo Kyohan" and its subsequent editions, but never translated into Japanese for his readers (or for readers of the English translation of his book). This text is identified as an excerpt from the Bubishi, a once secret book owned and treasured by many of karate's early 20th century masters. The Bubishi excerpt talks about various martial art precepts, principles, maxims and strategies as well as is the importance of knowledge of the rules of body energy, polarity and flow used in pressure point applications. That Funakoshi included this text but never translated it suggest its importance as a body of knowledge, but also something to be carefully guarded. This excerpt is later followed by Funakoshi's own well known twenty principles. Itosu's (Funakoshi's teacher) Ten Articles and Bushi Matsumura's (Itosu's teacher) Seven Virtues are also included. The reader thus has an opportunity to compare these philosophies and gain valuable insights to Funakoshi's own heritage and influences upon him. The publication is enhanced with nearly 40 pages of rare and historical photos, portraits, sequences of technique and translated calligraphy. Among them are the controversial 925 King Magazine illustrations that depict the story of Choku Motobu defeating a foreign boxer in a challenge match, but rather than Motobu being shown the drawings are of Funakoshi. Also of interest to many Shotokan practitioners and many historians is an informal chronology of Funakoshi as well as a bibliography and a fairly comprehensive index. Pat McCarthy should be congratulated on producing this text. Not only has he contributed to the investigation and research of karate history, but he is one of only a few who has produced their results through independent publications. Contact Patrick McCarthy at mailto:bujin@bigpond.com for more information or to make ordering arrangements.